The Abu Dhabi International Business Forum: A GREAT SUCCESS! The Abu Dhabi International Business Forum took place on December 11th at the St Regis Saadiyat Island Resort, Abu Dhabi and was co-hosted by the Lebanese Business Council and the French Business Group. The forum featured keynote speakers the patron of the event His Highness Sheikh Nahyan Bin Mubarak Al Nahyan, Minister of Higher Education and Scientific Research and His Excellency Sultan Bin Nasser Al Suwaidi, Governor of Central Bank of the UAE. H.E. Khalfan Al Kaabi First Vice President of Abu Dhabi Chamber, Sufyan El Saleh President of the Lebanese Business Council and Jean-Pierre Giraud President of the French Business Group provided opening remarks and emphasized Abu Dhabi position as a regional gateway and hub for international trade and commerce. 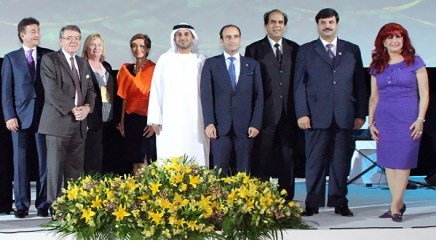 The format of this year forum had been redesigned and the event rebranded to be named the Abu Dhabi International Business Forum in recognition of the global environment in which we operate and the international presence of so many Business Groups from different countries around the world. 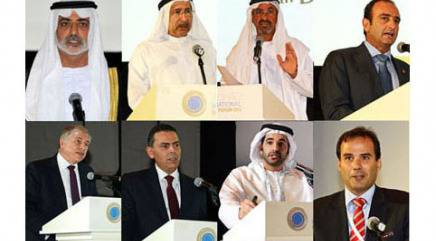 The revised format of the forum featured keynote speakers by industry experts followed by questions and answers sessions and was designed to be relevant, to address those business matters that are of prime importance and allow stakeholders in Abu Dhabi – whether they be government, public or private sector – to listen and participate in a constructive debate. The one-day forum boasted impressive policy-makers and attracted hundreds of companies’ executives and entrepreneurs from around the UAE. Topics such as the Central bank and finance, Infrastructure and the development of free zones for businesses, The Abu Dhabi economic vision and recent developments, urban planning and sustainability, tourism and culture, commercial banks and project finance were discussed. The forum provided an important platform for attendees to address challenges, exchange views on viable options and explore new business opportunities. The forum was anchored by an evening gala dinner in honor of the guests and featured multilingual entertainment by renowned acts that came especially from Lebanon to perform in the event. A commercial promoting Lebanon Tourism produced by the Lebanese Ministry of Tourism was played during the dinner.